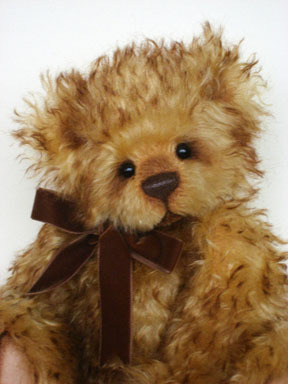 Caramel measures 17" inches tall and is a one-of-a-kind. 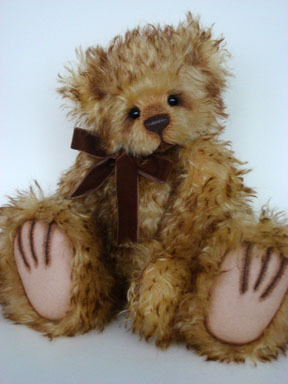 He is made from Schulte gold and brown tipped mohair with beige wool felt paw pads. He is fully jointed and also has a wobble head joint. Caramel is filled with polyester fibre and plastic pellets. He has black glass eyes, hand-shaded facial features, scissor-sculpting and a waxed embroidered nose. Caramel wears a chocolate brown velvet ribbon around his neck. 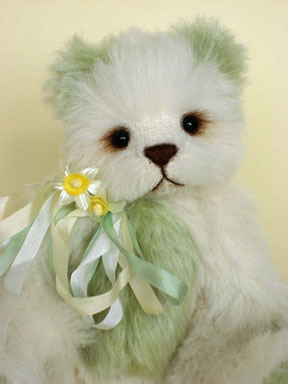 Aster measures 9" inches tall and is a one-of-a-kind. 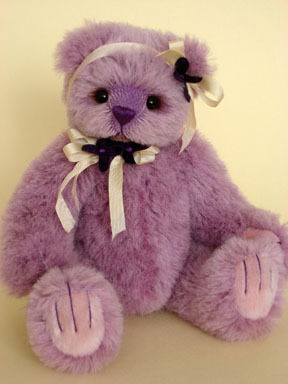 She is made from Schulte lavender alpaca with matching Sassy Fabric paw pads. She is fully jointed and also has a wobble head joint. Aster is filled with polyester fibre and steel shot pellets. She has black glass eyes, hand-shaded facial features and scissor-sculpting. 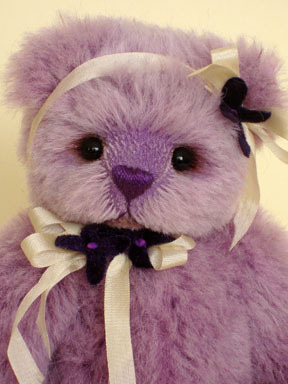 Aster wears a pretty cream silk ribbon with violets around her head and neck. Spring measures 9" inches tall and is a one-of-a-kind. 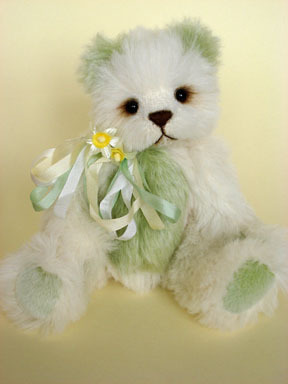 She is made from Schulte apple green and ivory alpaca with matching apple green Sassy Fabric paw pads. She is fully jointed and also has a wobble head joint. Spring is filled with polyester fibre and steel shot pellets. She has black glass eyes, hand-shaded facial features and scissor-sculpting. Spring wears silk ribbons and daffodils around her neck. 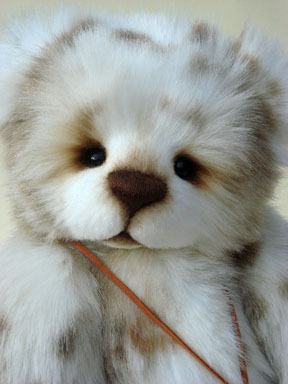 Leo measures 17" inches tall and is a one-of-a-kind. 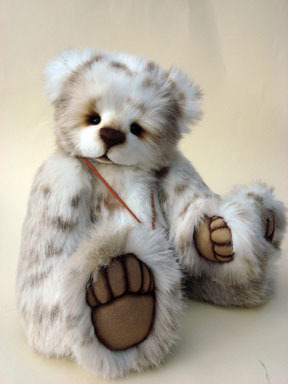 He is made from very soft dense Schulte faux fur with beige wool felt paw pads. He is fully jointed and also has a wobble head joint. Leo is filled with polyester fibre and plastic pellets. He has black glass eyes, hand-shaded facial features and scissor-sculpting. Leo wears an ultrasuede necklace with antique brown charms, bell and wooden bead. Oakley measures 12" inches tall and is a one-of-a-kind. 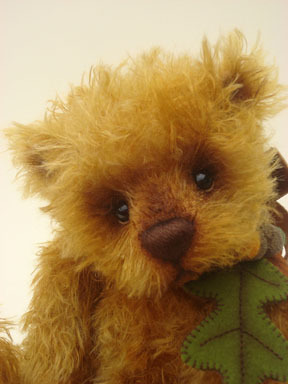 He is made from golden brown batik ratinee mohair with beige wool felt paw pads. His arms and legs are wobble jointed, together with his head joint. Oakley is filled with polyester fibre and glass/plastic beans. He has black glass eyes, hand-shaded facial features and scissor-sculpting. 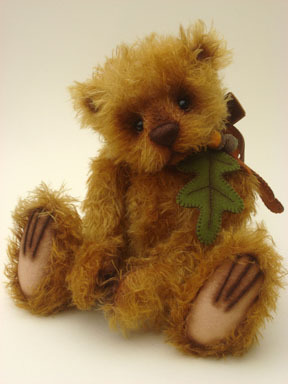 Oakley wears a brown velvet ribbon around his neck with embroidered felt oak leaves and acorns. Website created by Julie Guiver. Hosted by 1&1.